Park at Old Yeavering (NT924303) on the grass verge. Head past cottages, keep with track as far as directional fingerpost and then turn left along green track. Climb over steep ladder stile, turn right and walk as far as shin high directional marker. Turn right, signed `Easter Tor & Wester Tor`, cross ladder stile and head straight up on thin path. This eventually climbs steeply uphill and when gradient levels keep with main track ignoring side track to Easter Tor. 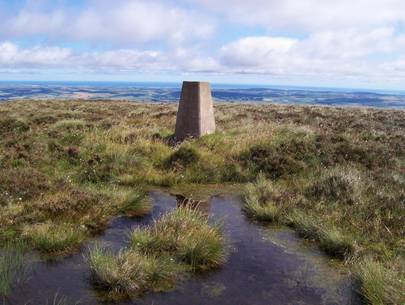 Eventually, when you are level with the path to Hare Law, signed `Hare Law ¼ Commonburn House 2¾`, turn right across heather covered ground to reach the trig point. Superb views to The Cheviot and more.